HomeBlogTechnologyMINI Scooter E Concept, Electric Scooter. MINI and the parent company BMW do not seem to cease presenting new innovations. After the presentation of the largest MINI ever created, the new MINI COUNTRYMAN, they unveiled the smallest vehicle in the MINI range, MINI Scooter E Concept. The new scooter is expected to be presented officially at the Paris Motor Show in October, but the first details and pictures of this new vehicle have already appeared in the BMW Facebook page. This is an all-electric vehicle intended exclusively for urban use. Its range is 100 km and the top speed 50km, while the petrol cap has been replaced by a Schuko plug. 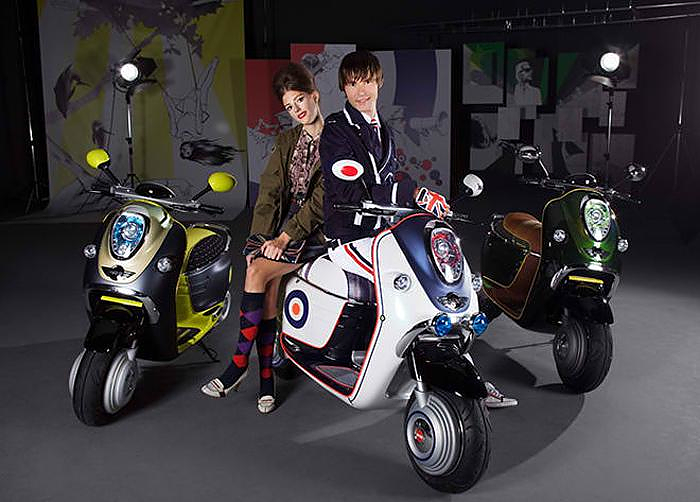 The Mini Scooter stands out due to its amazing design and the snap-in smartphone adapter. 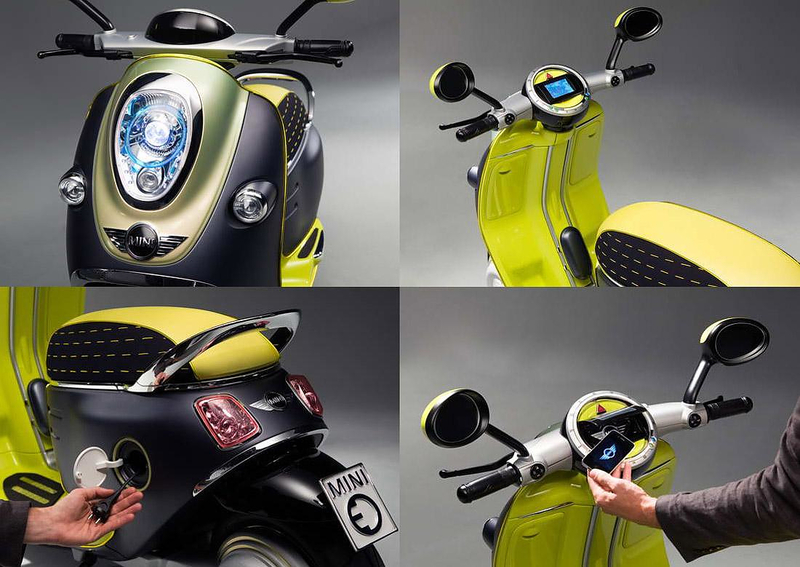 The first public photos of Mini Scooter are accompanied by an iPhone, but it is rumored that its built-in dock will be offered in different versions for various Smartphones based on symbian, android, windows mobile, etc. 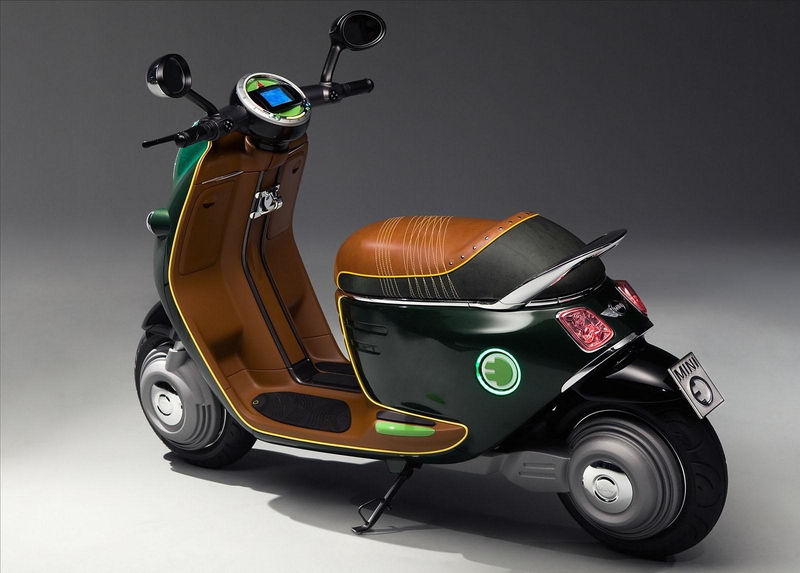 When the smartphone is connected to the dock of the scooter, the rider will see the data of the vehicle, such as battery voltage, engine status, speed, range, temperature etc. on the screen. 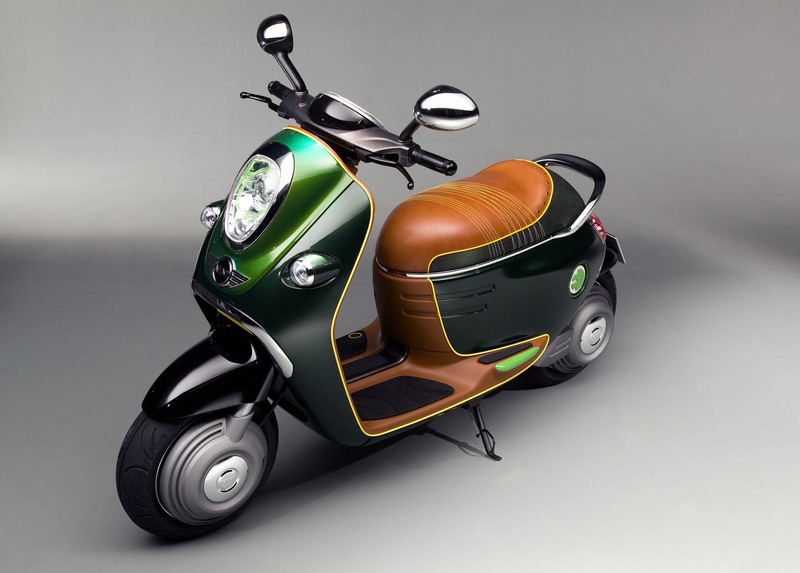 He will also have direct access to GPS navigation as well as to his music library through controls on the handle bars. The concept is that the smartphone will be simultaneously the vehicle key, information display and central control element. As soon as the rider docks his mobile phone and switches it on, the vehicle is ready to go. 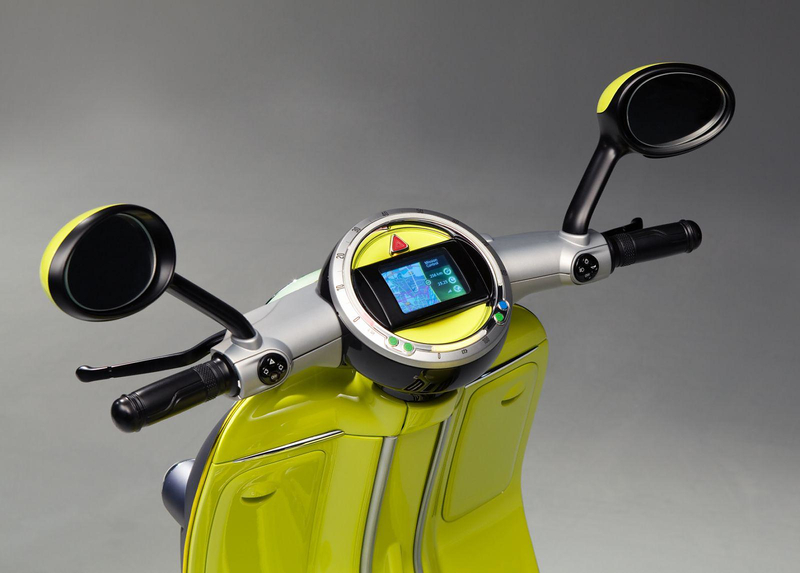 This configuration in the MINI Scooter E Concept allows the integration of information, communication and navigation functions, all in one device. 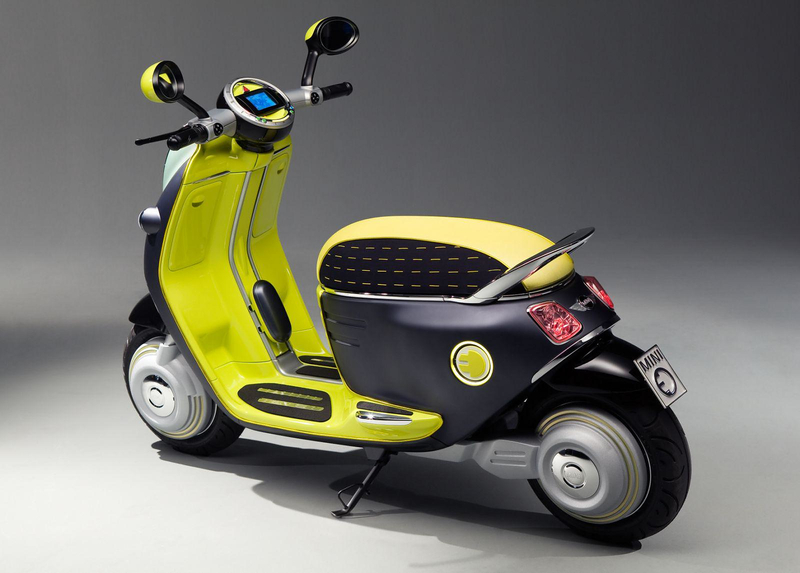 While the scooter is in motion, the smartphone can be used as a navigation system, music player, or telephone, as required. In addition wireless Bluetooth interface can be connected to a helmet from the MINI Collection, this special helmet is fitted with a microphone and headphones so that riders are able to use the telephone function or access their personal music collection while on the road. 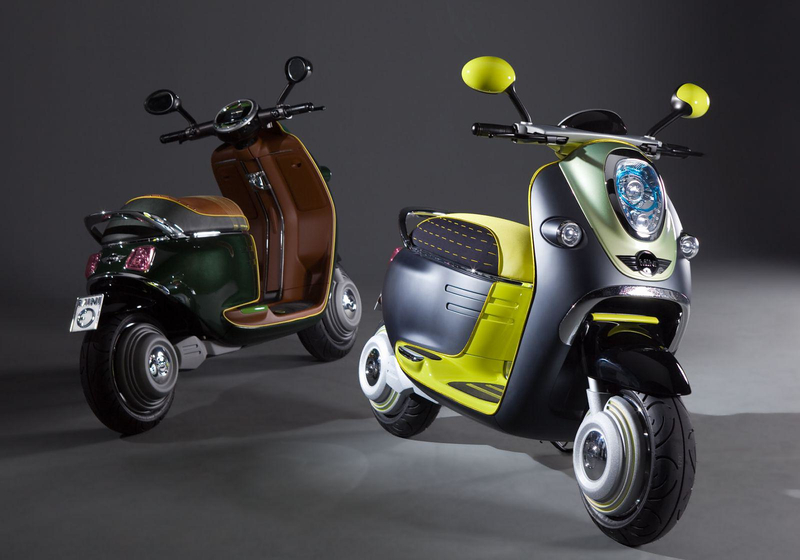 Apparently, BMW also paves the way for vehicles that communicate with each other, thus Mini Scooter has Wi-Fi which recognizes other Mini Scooters located at a short distance from it. 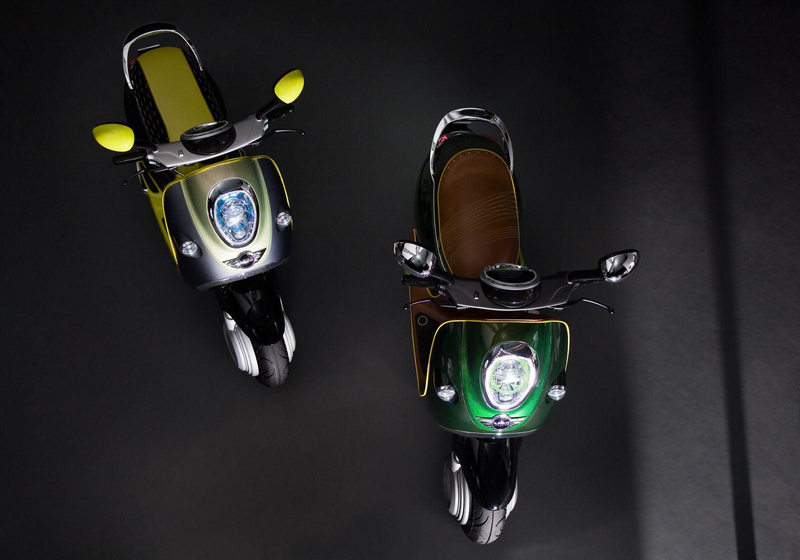 Initially, BMW announced that there will be an application for smartphones that will flash the lights when your scooter is passing near an identical one, as a kind of a Mini Scooter identification greeting, among the Scooter owners. 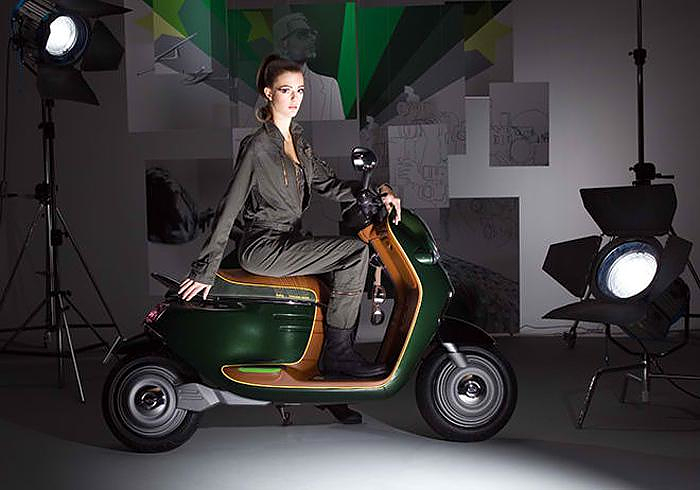 In terms of external design, Mini Scooter is unique and different (as expected by a maiden two-wheeled MINI vehicle). The styling details bear a clear resemblance to MINI cars and the vehicle is immediately recognizable as a true ambassador of the brand. 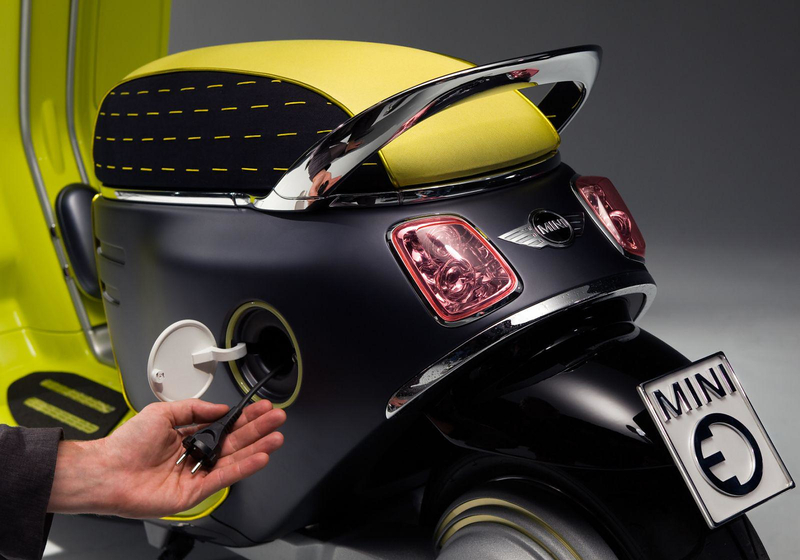 The rear-view mirrors on the MINI Scooter E Concept remind us of the typical MINI Cooper mirrors. The round contour of the mirror surfaces, the eye-catching volume of the hemispherical casing, as well as the different mirror cap designs that permit additional individualization options, are a direct reference to the signature MINI rear-view mirrors. 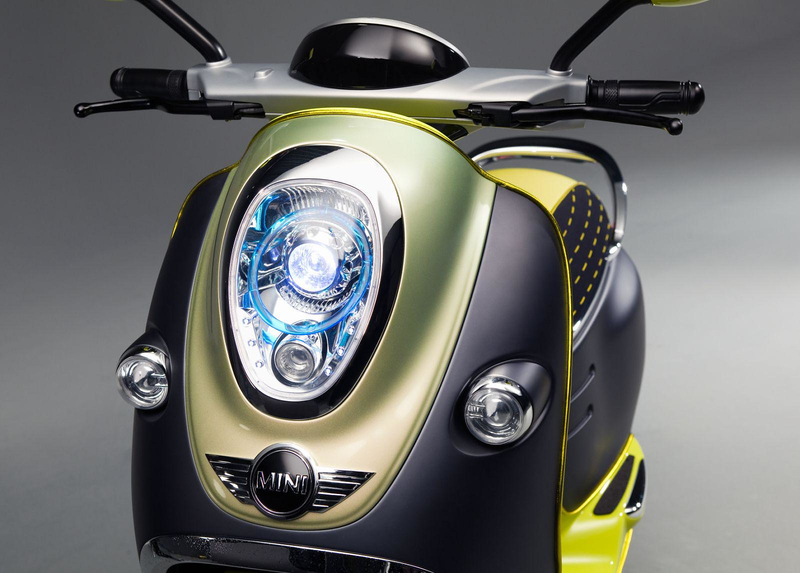 Another characteristic design feature are t the lights of the MINI Scooter E Concept. The headlight is almost identical to that of a the MINI Countryman. The two tail light units are mounted on the outside of the rear wheel fairing in an upright position. A transparent glass cover once more recalls the MINI Countryman and provides a view of the three-dimensional structure of the tail lights, brake lights and indicators. They also feature a distinctive chrome frame and the MINI logo is positioned between them. Furthermore the floor mat bears a clear resemblance to the aluminum pedals of the Mini Cooper S and the multi-function buttons on the handle bars are almost identical with those on the MINI Cooper steering wheel. 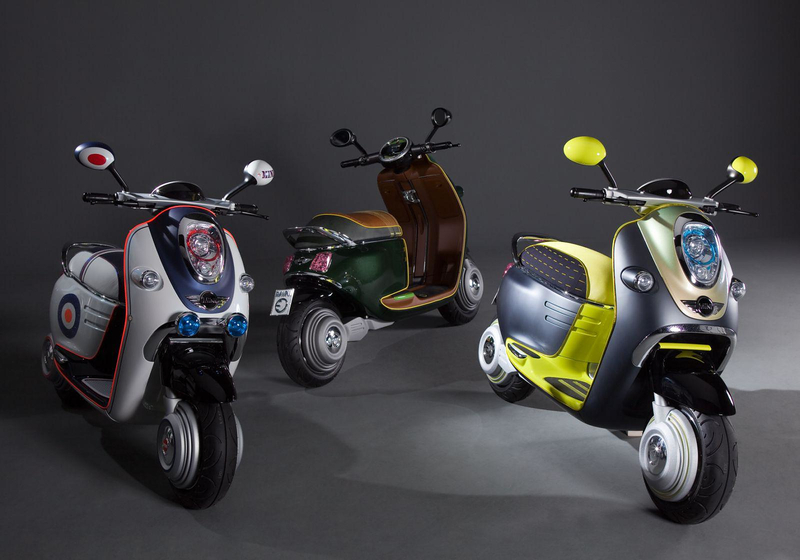 The designers have already created three different design approaches for the new scooter. The first thematic approach shows the ecological but premium nature of the vehicle with green color and moderately luxurious aesthetics. 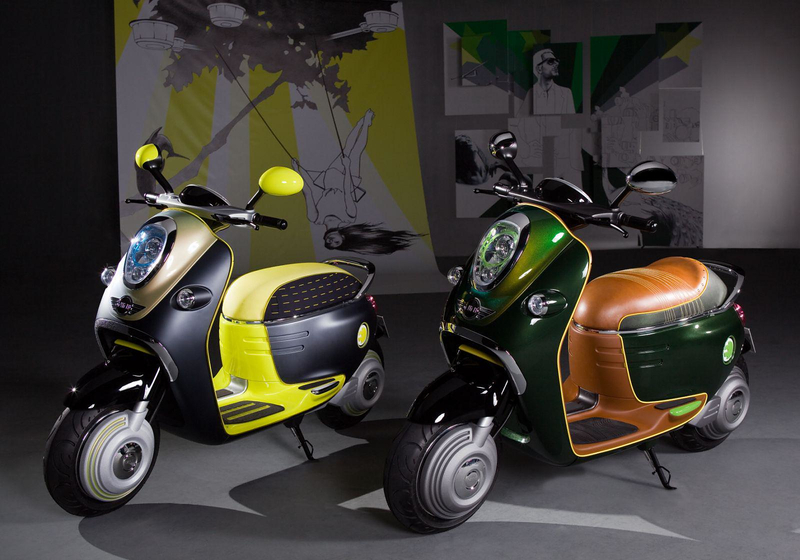 The second approach shows the technical and Gadget dimension of Mini Scooter with intense fluo colors and aggressive neo-modern aesthetics. Finally, the Third version has a retro character with classic British color and specific details, such as the optional fog lights that highlight its retro character. 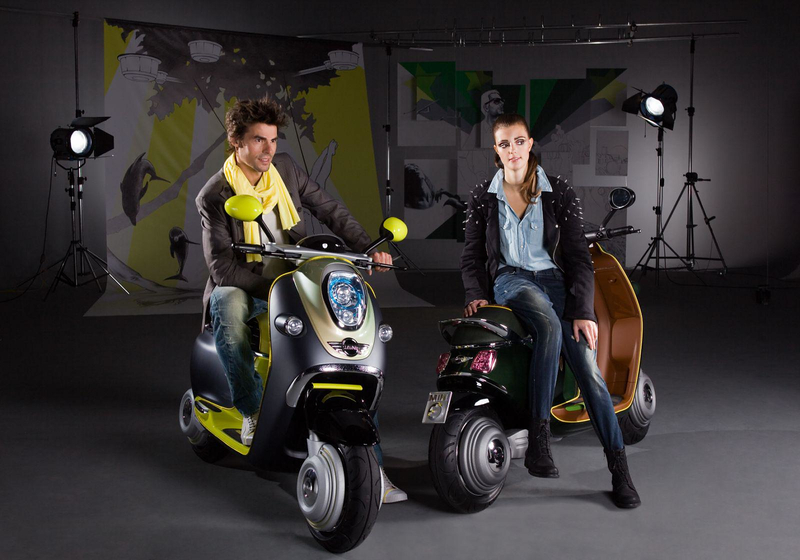 The huge innovation of Mini Scooter E Concept is that it combines two of the most popular and most essential products of the modern era: vehicles with mobile phones, i.e. transportation and communication. Thus the urban transport vehicle is modernized and enters the digital age, while the already countless capabilities of mobile devices are expanding. Having already assumed the role of audio reproduction and satellite navigation, now everything indicates that they will become platforms of information and interactive communication used for vehicle control. There are already applications that use GPS or mobile gyroscopes (eg. the iPhone accelerometer) to calculate average speed, consumption, acceleration and other data related to vehicles. 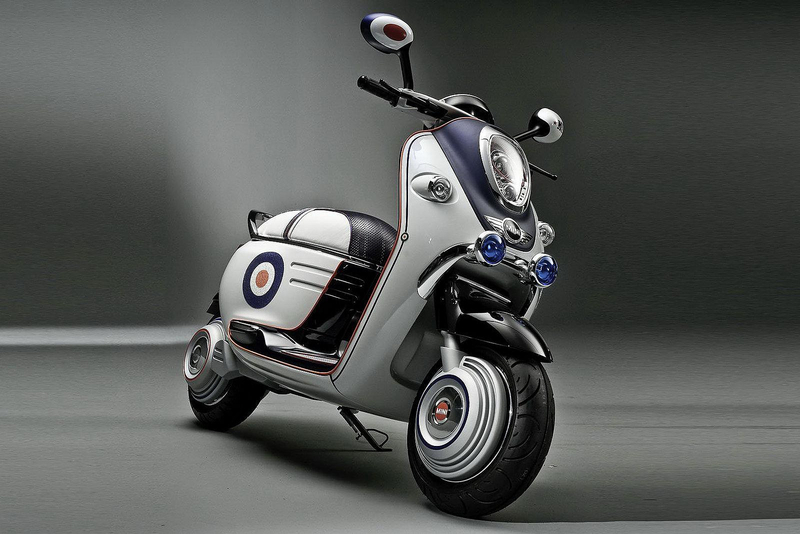 We imagine that with this level of integration that the Mini Scooter has, it will not be hard for a mobile phone to access the vehicle sensors and offer setup features, even for functions such as suspension rebound, engine maping, braking response and others. The future of electric vehicles seems more promising than ever.